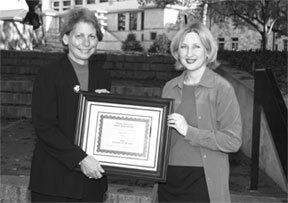 Laura Papotto (right), business manager for Emory College, was named 2001 Employee of the Year by the College Staff Consortium. Pictured here with Senior Associate Dean Rosemary Magee, who nominated her for the award, Papotto is a 13-year employee of the college. I won a University Award of Distinction a few years back, and I have to say the College Staff Consortium award was even more meaningful because it was my peers who voted for it, Papotto said. It was a big surprise and a big thrill. It really does have great meaning to me. Photo by Ann Borden. The funding campaign for the Donna & Marvin Schwartz Center for the Performing Artswhose Oct. 24 "topping-off" ceremony is shown abovehas been provisionally awarded a $750,000 grant by The Kresge Foundation. Emory must raise the remainder of its capital campaign goal$2,835,165by December 2002 to become eligible for the grant. The Schwartz Center, located at North Decatur and Clifton roads, is scheduled for completion next fall and will house performance, rehearsal and studio space for music, theater and dance departments and programs. 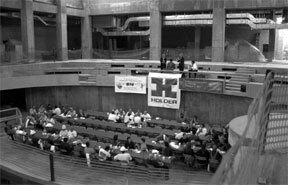 The facility is highlighted by an 825-seat concert hall, a 135-seat laboratory theater and a 135-seat experimental dance studio. In addition, it will house classroom space for creative writing and other programs, as well as a vault for film studies. The Kresge Foundation awarded 97 grants between January and June 2001, totaling $71,717,000. Gifts from The Kresge Foundation are directed at projects involving construction or renovation of facilities and the purchase of major capital equipment or real estate.